If you found an injured bird, there are several things you should and should not do. Birds can be injured in a variety of ways around our homes and work places. The most common injuries come from crashing into windows or wire fences, being caught by cats or dogs, getting hit by cars and falling down into chimneys. The Injured Bird May Only Be Stunned or "In Shock"
In many cases, the bird is only stunned or is in shock. It may soon recover on it's on if it can be put into a quiet, safe place (outside) and protected from the heat in the summer and from the cold in the winter. If you found an injured bird, keep the bird outside so it can fly away if it does recover. I have seen birds "wake up" after what looked liked they "broke their necks" from hitting a window. They were obviously just stunned. I also saw a bird fly away even though it seemed a cat had already killed it. The bird was so exhausted that it couldn't move anymore. Once it stopped moving, the cat was no longer motivated to playing with it and walked away. Don't know if it survived or not, but it was able to fly away. It requires State and Federal permits to legally "rescue" or "rehabilitate" or care for "Abandoned" protected birds. Birds are protected by the Migratory Bird Treaty Act (MBTA) and it is against the law to handle wild birds. You should know that it is even illegal to possess a bird feather. Only State rehabilitation permits are required for most mammal species. Even heard a story of a foolish man that shot a Red-tailed Hawk (illegal, unethical, irrational) and took it in the house to show his kids. The red-tail "woke up" and started flying around the house until the man shot it again in the bedroom. Karma, but he still has more coming. Injured wild birds can also have a strange and complex reaction (sodium & calcium) to stress where they have muscle cramps and can not fly. This doesn't usually happen to them in the wild, but can happen after they become captive after hitting a window or some other reason. I have also seen this same stress related muscle cramping in a dog and in humans. The dog was afraid to ride in back of the truck since he was in an accident and the person was afraid of flying in a small plane for the first time. 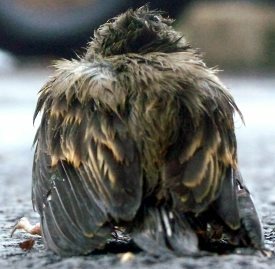 If the injured bird isn't able to recover on it's own, the best bet is to continue to keep the bird in a safe place and call a professional wildlife rehabilitator or bird rehabilitation center at the Wildlife Rehabilitation Information Directory. Do not attempt to feed the bird either because you could do more harm then good. It is okay if you want to fill a shallow container of water and place it next to the bird so it can drink, but do not force it. And here's what to do if you Found a Baby Bird.